foresight research, social consultations, evaluations and monitoring. 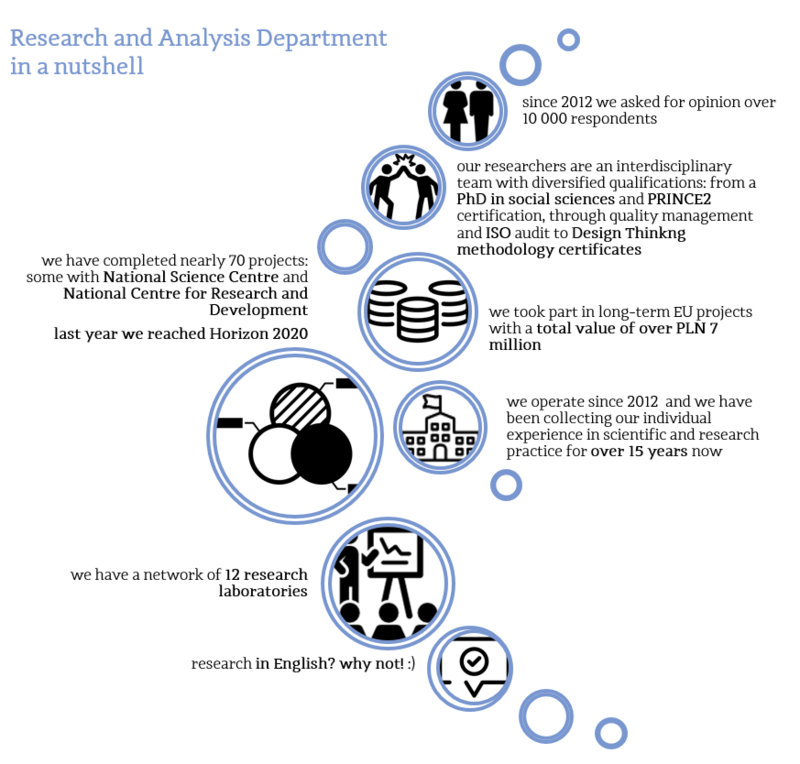 Research and Analysis Department is an interdisciplinary team of researchers, with wide experience in scientific and commercial research. Research/scientific personnel of CZIiTT has knowledge and competence in the area of sociology, economy, psychology, information science, social policy and culture studies. Research and Analysis Department has been established on the basis of the Social Researches Support Department in the Office for Research and Strategic Projects of Warsaw University of Technology. “Needs and expectations of young Polish scientists related to professional research career development” Research carried out within the “Polish ERA Mobility and Career Days” project funded under the EU research and innovation programme HORIZON 2020 and by the Polish Ministry of Science and Higher Education. Report here. The situation of graduates on labour market. Annual research at Warsaw University of Technology. Infographic here. “Visual Thinking – Effectiveness And Areas Of Application” The main goal of the study was to diagnose the impact of visual thinking on the process of information acquisition. Report Summary here. Based on the report a visual presentation was made and is available here. … more reports coming soon!